I Love Shopping For My Children, They Grow So Fast & Most Of The Time That's All I Feel Like I'm Doing Is Shopping! 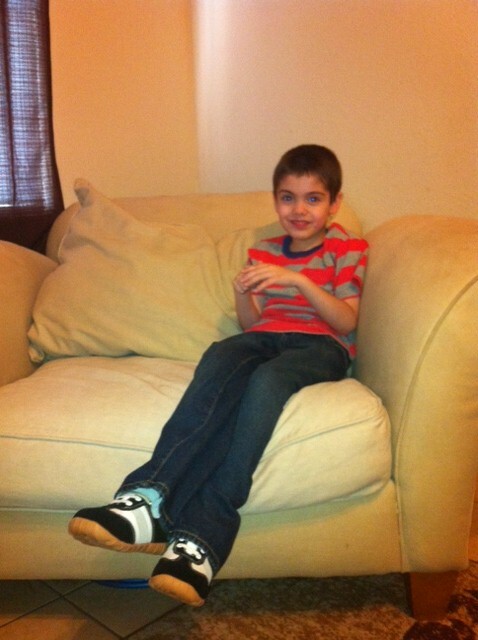 When It Comes To Shoes, Every Kid Needs A Few Pairs To Choose From! I Came Across Shoemees & I Quickly Wanted To Learn More About The Company! Your Shoemees Will Arrive In This Creative, Reusable Box That Is Made Of Recycled Materials! When I Opened The Box, A Friendly Plush Toy Greeted Me Along W/A Pair Of Shoemees Shoes, Fun Stickers & More! Shoemees Shoes Are Environmental, Natural & Breathable For Your Little One's Feet! These Stylish Shoes Have Waffle Design Soles That Are Skid-Proof, Soft & Shock Absorbent! I Love The Color Combination & Style! 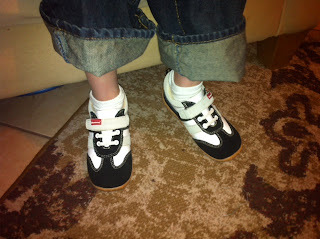 These Shoes Are True To Fit & Look Great On My Big Guy! 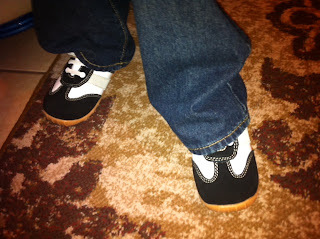 Shoemees Shoes For The Moment Are Only Available In Sizes 10-1, But They Are Hoping To Expand Soon! My Son Is Wearing Shoemees In A Size 12 In Black, Beige & White! I Love Companies That Are Trying To Making A Difference In Our World & Shoemees Is Trying To Save The Planet One Shoe Box At A Time! So What Do You Like About Shoemees? Connect With Shoemees On Facebook & Twitter! I so want some for my daughter. How cute would it be to let her open the box and find the stuffed animal there? And shoes, too! She'd be over the moon. These look like they are terrific quality and what fun a child would have to receive this! 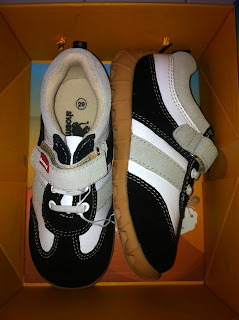 Shoemees would make a fun gift, a toy and shoes all in one package. The reusable box is great also. My name is Melissa and I own Shoemees, if you enter this code before the end of September I will ship you your Shoemees free!